I speak to many Fortune 500 executives on a regular basis, sharing the messages and the lessons that are so desperately needed in the business world today. I am truly passionate about speaking because I have useful, inspiring information that changes the way people view their work – I help them to see just how important they are and what they have to offer as well as, perhaps most importantly, how to tap into the very best version of themselves. The more people I reach with those messages, the more we have the capacity, together, to inspire people to see the business world differently and to go out there and make a positive difference in their lives, their workplace… and their world. My hope is that this page will make it easy for you to get the information you need to make the best possible decision as you seek to find just the right speaker to inspire and motivate your audience. Please take just a few moments to explore the contents of this page – you may just find exactly what you are looking for! Thank you for stopping by and for considering me as a speaker at your next event. I am truly honored. Select me as a speaker, and I will give you a 110% effort. I will act as a catalyst, helping you achieve the goals you’ve set for your event. When you win, I win – it’s just that simple. An announcement about your event on my blog and social media channels (If your event is open to the public and you would like additional visibility). A professionally prepared, dynamically delivered presentation focused on achieving the outcomes you want from your audience. I have been speaking publicly for more than 15 years and have given keynote speeches at many events. I devote my time to writing on key leadership topics, coaching high performing executives, and speaking to corporations, associations and organizations worldwide. I write a highly respected leadership blog that reaches hundreds of thousands of readers from around the world. In addition, I have more than 35,000 followers on Twitter.I have spent my career in global business, most recently as the CEO and Managing Partner of Luminosity Global Consulting Group, a premier consulting and executive coaching firm focused on creating exceptional leaders across boundaries & borders. I have been happily married to my husband (and best friend), Steve, for over twenty-five years. We have two amazing kids, Stephen and Savannah. We live outside of Los Angeles, California and in my free time, I enjoy reading, outdoor activities, and travel. 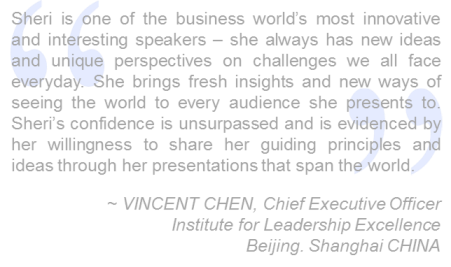 Sheri speaks on topics related to leadership, global mindset, productivity in a globalized world, and cross-cultural success. She customizes all her presentations to meet your organization’s specific needs. 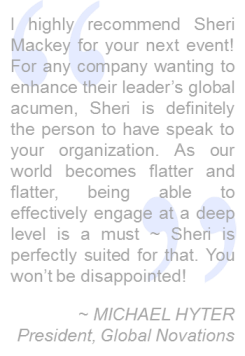 Sheri’s goal is to facilitate the outcomes you want to create. 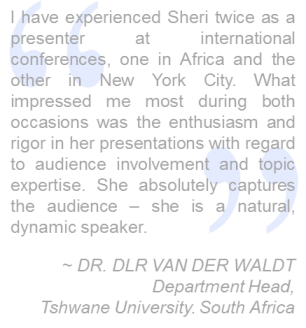 Keep in mind that Sheri can present any of these topics in a keynote, workshop or seminar format. Good leaders are always in demand. But what happens when a good leader, or even a great leader, is distracted with organizational drama that inhibits employees from giving their best and impedes organizational success? What happens when objectives are not met because organizational drama impacts colleagues’ ability to get things done? 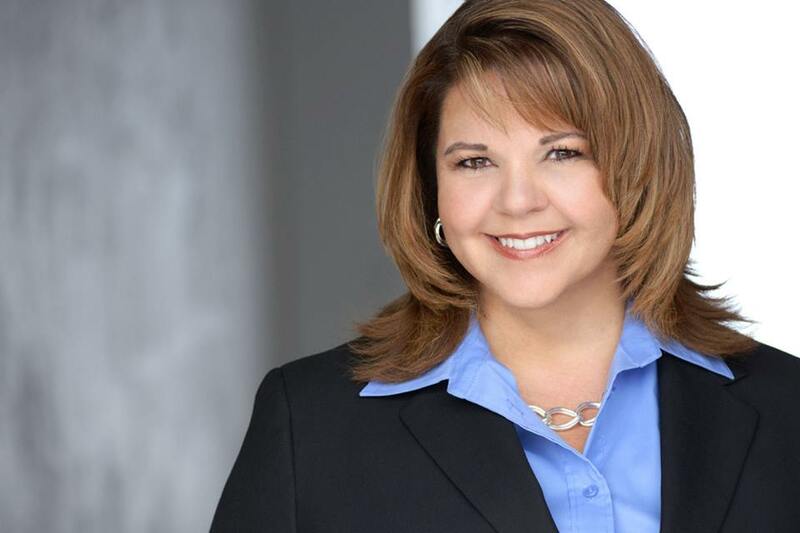 Using examples from her amazing adventures throughout the world, Sheri teaches in unexpected ways that managing the drama in your organization can lead to exceptional leadership through four critical steps. All successful people are big dreamers. They imagine what their future could be and then they work every day toward their distant vision… that goal or purpose. However, a dream without a plan…. is just a dream. Where do your employees see themselves five, ten or even fifteen years from now? Are they thinking about what their ultimate success will look like and how it will impact the organization? They need to understand today that their ultimate destination is not going to materialize on its own… They need to seek it out. When all is said and done, the benefits of virtual teams far outweigh the costs in terms of maximizing resources and ensuring the long-term viability of the global organization. There is a real and present need for virtual teams to think insightfully, and creatively, about complex issues. It is a critical success factor for virtual teams to have the capacity to drive significant business results. In this poignant presentation, your organization will learn four critical components to virtual team success. Exceptional global business growth and performance are accessible with a commitment to hard work, integrity and the explicit belief that everyone, from every culture, has significant value to add. In this talk, Sheri focus’ on the value of your global resources and how to successfully leverage them to deliver amazing results. Using examples from my her experience, as well as relevant examples from the business world, she explains that leveraging people across boundaries & borders involves five critical steps. Dream Team or Extreme Team? As an effective leader, you realize that people will determine whether or not you win at the great game of business. The question then becomes: Are your leaders going to dream of what it would be like to have a team that works well together, executes across boundaries & borders, and produces Extreme Results OR are they going leverage their people to build an Extreme Team that does all of that and more? In this presentation, Sheri highlights what it takes to build and inspire an Extreme Team, while providing critical action items everyone can implement. Currently, we receive more inquiries than we are able to accommodate. Due to time constraints, we can not accept all requests for Sheri to appear at a live event. We are currently taking bookings for Q2 of 2014 onwards. Complete and submit the online Check My Availability/Inquiry Form. **Please note: due to time constraints, we will not be able to take phone call inquiries without this first step. Within twenty-four hours someone from our office will contact you with a reference number and more information. Once your completed form is on record with our office, our booking agent will contact you. At that time, you can also call the Office Assistant at +001.818.276.6681 with your reference number to discuss the event further. Review and agree to Sheri’s speaking requirements found at Getting The Most From Our Partnership.